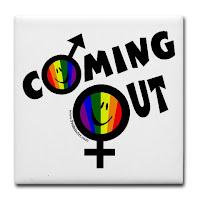 Coming Out. It's not easy... and for a lot of people, harder than being gay itself. This is also the reason why it is hard to write about. It's a different case for everyone as we all live different lives. Stepping outside the closet, like being gay is not something that can be taught. There isn't an art to it and no one in their right mind can teach you the proper way of coming out. However, there is one common factor with all gay men and women who don't quite know how to come out... fear! For this reason, it is best to know a few tips from those who have been there than that, over it! Stepping outside the closet is one of the most daunting thing a gay man or woman can do. The idea of telling your family and friends of what seems to be a very private secret, can be a scary prospect. To think about the negative impact this might have.. but that's where the problem lies! For most gay and lesbians it is the negative aspect that we think about first. Why bother come out at all? Instead of asking yourself why bother coming out, why not ask yourself what the positive outcome this will bring to your life? For one thing, most actually find that nothing in their lives is different! The only change they made was to be completely honest about their sexuality to those around them or who they choose to open up to. The other side of the coin is that you enter a whole new world. A gay world (pun intended)! There are a few things to consider before you bite the bullet with the obvious biggest one is how well the people you are going to tell are going to react. Try to take as objective an eye as possible when considering potential reactions, perhaps try testing the water... drop into a conversation like a subtle reference to a current gay star (Adam Lambert), or character from a TV series (John Barrowman), or a band (Mark Feehily)... perhaps mention that a friend of yours is gay, and gage their reaction. Generally people harbour an irrational belief that their parents and/or friends are homophobic when they are in the closet. Sometimes this is actually the case (and perhaps it is advisable to not come out until you are no longer reliant on the people in question) but usually it is fear that drives you to believe these things (we all like to believe our parents are out to get us). When it comes around to telling, it can be useful to go through what you would say in your head so that you are absolutely clear before starting. The usual way is to strike up a conversation with a question "What would you think if I told you I were gay/bisexual/trans?". Coming straight out with "I am gay/bisexual/trans" can sometimes be the most straight forward and undeniable approach. It is however, only done by the bravest of us all. After coming out, your parents or friends might act unpredictably but don't be immediately concerned about this! It is quite normal for it to come as a shock and therefore, in the heat of the moment, some irrational things may be said (which are often not a true reflection of their feelings on sexuality/gender). A typical response is, "You're lying!" or, "You can't possibly know, you are too young" or, "I had a female/male friend who said he was, but just hadn't had a girlfriend/boyfriend". There are a lot of known bizarre responses. Just make sure to confirm you are sure and that you are not taking the decision to come out lightly. Your family and friends might also be worried for your safety. Many of them won't know the real risks of homophobia but will probably have heard horror stories about people being hurt or killed because of their sexuality. Try to assure them that these attacks are very very rare in modern society. Should you receive an abusive response, especially if it is physical, you should seek help immediately! If you are physically attacked you should seriously consider calling the police, many of them have specific LGBT representatives. Generally speaking people's experiences with coming out are cathartic (a weight off of the shoulders) not violent, so unless you have any reason to believe they are homophobic, you will be fine! Friends are more often than not the easiest people to tell first. Having someone your age that you can talk to can lift a great deal from your mind and knowing someone is always going to be there for you is comforting. It can really help build your confidence when coming out to others. You might have the feeling that telling a friend that you're gay could ruin a great friendship, but in many cases coming out to a close friend can create a stronger bond and bring you closer together. One might say that coming out to your friends will show who your real friends are – the ones who will continue to be there for you and respect you no matter what. Although friends are more likely to accept your sexuality, it still may be wise to gauge how they may react beforehand to be certain that you’re telling the right person – someone who you are sure will not let slip to anyone else and will be there for you when you need it most. After you come out, your parents or friends may want to know more, or may need some help with coming to terms with the various complexities that surround having a gay or trans daughter or son. In today's society, there are a lot of great services to support the families and friends of gay and lesbian people. Try and look for more information within your community. I encourage you to send us a message via Your Gay Question? or email me at redice11@live.com.